OMAHA, Neb. 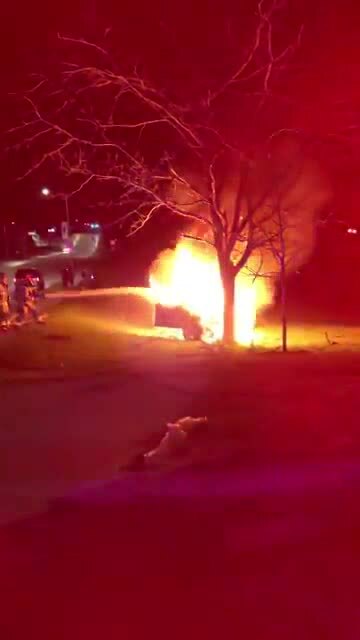 (KMTV) — A personal injury crash near 50th and Ames Ave. sent an intoxicated driver to the hospital with injuries after striking a fire hydrant and tree before his vehicle caught on fire. At 3:53 a.m., officers were dispatched to the scene of the crash. Investigation showed a 2014 Jeep Grand Cherokee was westbound on Ames Ave., left the roadway near 49th St and struck a fire hydrant. The driver continued back onto Ames Ave. The vehicle drifted left, crossed the raised median, entered into eastbound lanes of traffic then left the roadway on the south side of Ames Ave.
A tree was struck by the vehicle near the intersection of 50th and Ames Ave. The Jeep started on fire but several people helped pull the unrestrained driver out of the vehicle. Omaha Fire worked to extinguish the flames and transported the intoxicated driver to Nebraska Medical Center. The driver was identified as 22-year-old Dominick A. Davis. Davis was treated for facial fractures. He was cited for negligent driving, collide fixed object, no seatbelt and a DUI. Ames Ave. was closed from 48th to 50th until 6:30 a.m. Thanks to Officer Jeremy Zipay for the video.